Remembering the content of your ppt slides and run a common & clear thread through your presentation is key to get your message out. However, it just happens that you will experience situations you may not be 100% comfortable with – e.g. you have to present on behalf of your boss and therefore not using your own slides, or it’s critical to follow a very defined and narrow script in order to make sure important points are placed where they belong to. Or you have just a bad day or some jet lag, and the flow of your words is not what you are normally used to. These are some cases in which it helps tremendously if you know what’s on your slides and which slide comes next – by heart. Reading text from the beamed picture on the wall or constantly looking down reading on and speaking to your Laptop is not how you want to be perceived by your important audience. Pauk provides a method how you can train and learn your presentation offline, in depth and while you are on your business trip. 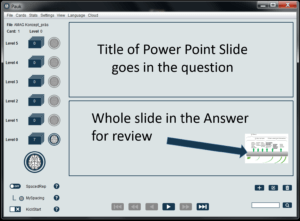 You will easily remember what is on each slide which enables you to do outstanding presentations. Instead of using energy searching for logical content, you can fully concentrate on the reaction of your audience and play your personality to the max. You will appear as a secure and strong leader who is in control himself and the crowd. People will much more enjoy listening and you will be perceived as being well prepared. In the answer card, the whole slide is imported as a picture. If needed, add information to each question and answer. Can be the number of facts to remember in the hint field etc. Start Learning. Pauk will tell you for each slide if you can present them with ease or not. Best strategy for learning presentations is to use normal learning mode – without SpacedRepetition or KickStart. Train the ppt’s until you reach Level 4 and 5. Repeat the slides always in the same sequence as you will present them on the event. If you have a lot of slides, split the deck in smaller packages of about 15 slides max. Repeat them in separate sessions. Congratulation! Your presentation will be awesome.